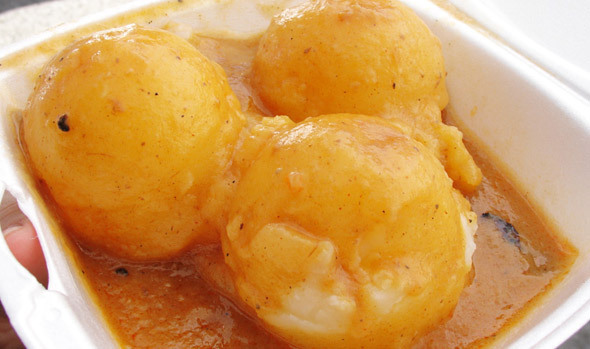 This week, the second wave of my mashed potato search had me yo-yo'ing from the Annex to the Junction and back again. First stop: Future Bakery (483 Bloor St West). Future's is one of the only places I regularly have mashed potatoes. That might be because they're actually quite good or maybe just because they're on display at the hot table and I can hardly resist the mountain of hot mash when approaching to order. When the server asks if I want gravy, I go ahead and have him pour in on. The gravy here is a thick mushroom gravy I've never seen anywhere else. It's usually quite good - not to mention vegetarian-friendly - and makes this side of mash (pictured at the top) amazing enough to consider going back for seconds, no matter how filling the first serving was. Over the weekend, I was busy exhibiting in the Junction Arts Festival, and it just so happened that my booth was parked in front of the Purple Onion (2998 Dundas West). This diner-meets-steakhouse recently relocated from it's original location at St Clair & Keele to the arty strip of Dundas West & Keele. One thing I remembered about the old location, was that mashed potatoes came alongside most dishes. Sure enough, that hasn't changed, so I picked up a take-out side of mash to have in my booth. Three medium-sized scoops of mash came smothered in a light-coloured gravy (didn't get the chance to ask what kind it was). The scoops themselves were a little freakishly round, but beyond that were pretty good. Gravy helped as they didn't have a lot of their own flavour going on. The consistency was nice and soft, fitting for a side that usually comes paired with a big Purple Onion steak. I'd have 'em again. The last stop this week was also unexpected. Walking along Bloor to the subway, a menu in the window of Country Style Hungarian Restaurant (450 Bloor St West) caught my eye. Known for homestyle Eastern European cooking, Country Style serves up mashed potatoes as a side or along with one of their traditional entrees. Having never had a full meal here, I decided to come back for a the schnitzel another day (expect a full review in the next week or so), and stick to a side of mash for now. Good thing, 'cause the side here was pretty much a meal for me. Three big scoops were served up, and as I went to add a little pepper, the waitress asked if I'd like some sauce, explaining that they had a great chicken sauce that'd be really nice with the potatoes. A minute later she returned with a bowl of reddish sauce/gravy for me to smother the taters in (pictured here). 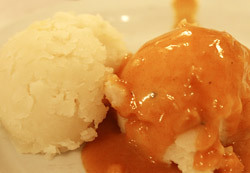 The gravy definitely made this dish as it softened up what was a good but weighty mash. Unlike some mashes, where you taste the butter or cream first, here you taste real potato. It's solid, stick-to-your-ribs mash, if ever I've tasted some. I would definitely order it again but always with some gravy... which, by the way, was really good stuff. I'll have to ask what it is usually served with and order up some of that. A top pick this week is tough to choose. Future's was golden and creamy, but that chicken gravy at Country Style was pretty great. Still, this is first and foremost a mashed potato search, so though they all were enjoyable, I'm going to hand this one to Future Bakery. I'll be back with the 3rd and last installment soon! 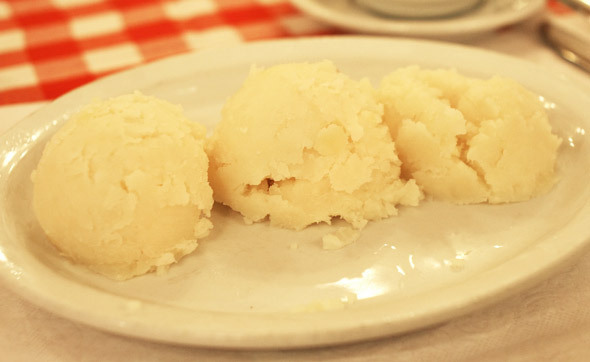 Read Part I and Part III of the blogTO Best Mashed Potatoes in Toronto.